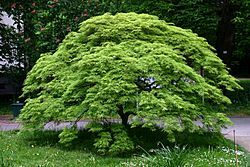 The sporophyte produces spores (hence the name), by meiosis. 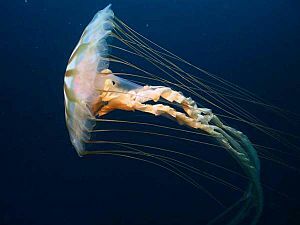 These develop into a gametophyte. Both the spores and the resulting gametophyte are haploid, meaning they half as many chromosomes. Later, the mature gametophyte produces male or female gametes (or both) by mitosis. 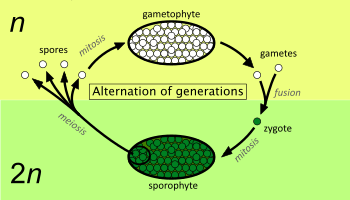 The fusion of male and female gametes (fertilization) produces a diploid zygote which develops into a new sporophyte. This is the cycle which is known as alternation of generations or alternation of phases. 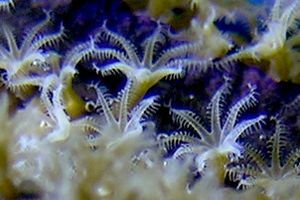 "The diploid condition brings about an increase in flexibiity because it makes possible the condition of genetic dominance and recessiveness. In a haploid organism every new mutation is immediately exposed to the action of selection... In a diploid organism, on the other hand, each new mutant arises as a heterozygote and, if recessive, is sheltered from selection". 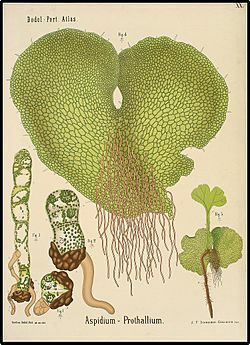 Gametophyte of the fern Onoclea sensibilis (the flat thallus at the bottom of the picture) with a descendant sporophyte beginning to grow from it (the small frond at the top of the picture). 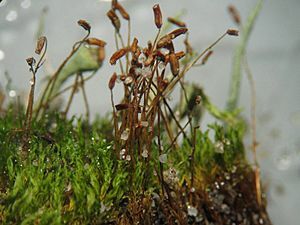 Gametophyte of Mnium hornum, a moss. Sporophyte of Blechnum discolor, a fern. Gametophyte of Pellia epiphylla with sporophytes growing from the remains of archegonia. Diagram of alternation of generations in liverworts. 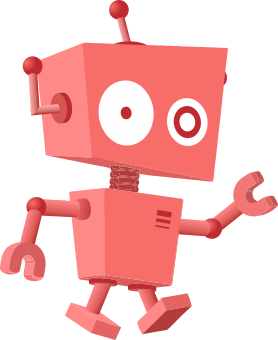 Alternation of generations Facts for Kids. Kiddle Encyclopedia.